Firstly, we would like to thank you for choosing Donegal English Language School for your Riding holiday. Please find below further information on your stay. There are hairdryers on campus. They are located in the coordinator room. Hats bearing only the EN1384 or BSEN1384 standard will no longer be accepted. For insurance reasons there can be no exceptions to the rule. If labels are cut out of the riding hat, unfortunately, it will not be able to be used. For students who don’t have a suitable hat, there are hats available for rent. The fee to rent a hat is €5 per week. This is paid to the riding school on the first day. Full Body protectors are compulsory for all Cross-Country Lessons and any jumping over 60cm. A limited number of body protectors are available for hire @€2.00 per session. It is recommended that students bring their own body protectors if they wish to jump cross country. If air jackets are worn they must be worn over a body protector. Clients ride around 1.5 – 2 hours per day with other time being spent on horse care. Students are offered basic instruction in riding and outdoor activities. While jumping and cross country are one of the riding activities provided. We do not offer training courses in jumping, dressage or eventing. The horses provided are leisure horses & ponies, flexible and appropriate for activities offered. Goals of a student’s riding week is to have fun on horseback, discover Ireland and improve English speaking. All our lessons apart from absolute beginners are taught in the modern coaching manner. So all lessons are in open order with the riders being given an exercise to do in their own time, advice is then given to improve the horse & rider if needed. We no longer stand in the middle of the school directing riders telling them where to go and when. Horse management in Ireland is often very different to other countries. Our horses live in a natural environment in the fields. This system gives them the opportunity to live in herds, walk around, eat a natural diet and remain happy in their work. The grass grows for longer here due to the mild climate and rainfall. Grass is the horse’s natural food it is what they would eat in the wild. The horse’s natural lifestyle is as a herd animal walking and looking for food, eating little and often. When living out the horses keep a lot of their natural protection against the weather e.g long manes, feathers and hairy legs. The horses also roll in the mud to give them extra protection from the wind and rain. As our horses live outside, grooming a grass kept horse is very different from grooming a stabled horse. Grooming is kept to a minimum so as not to remove the natural oils from the coat which help to keep the horse warm and dry, there is no strapping (full groom). The horse’s just having the main parts of the mud taken off with a dandy brush with attention being paid to saddle and bridle areas. At the end of the day all horses are hosed off (water) to remove any sweat & sand. They are then fed and turned out to enjoy a good roll. A lot of our horses do no road work at all so the need for shoes is kept to a minimum. Most of our horses are only shod in front as this reduces any injuries in the field from kicking. Morning groups help groom and tack up and untack (put on/off saddle and bridle). Afternoon groups tack/ untack (take saddle and bridle off, hose the horses (wash them), feed them and bring them to the field. At the start of each day the horses are caught up from the fields, fed, groomed and then tacked up. The horses are tied to the hitching rail or in the stalls ready for use. Our horses live a fairly stress-free life and you will rarely see any of our horses with vices such as weaving, cribbing and wind sucking. For insurance reasons, a hat and gloves has to be worn at all times when leading your horse. Riding Hats must be worn and fastened at all times whilst handling the horses this includes grooming, tacking up and turning out/bringing in of horses. Correct footwear must be worn at all times. No trainers/runners. No jewellery may be worn whilst in the yard apart from watches. Any piercings that are visible and cannot be removed must be covered. Gloves must be worn whilst leading any horse. No headphones, ipods etc. Are to be used whilst on the yard. Body protectors have to be worn for all cross-country lessons. Instructions given by any member of staff, are given for your safety and must be adhered to. No smoking anywhere on the site. Students and group leaders can be contacted on 00353870518592. Students can be contacted from 6 pm – 9.00 pm each evening. Laundry is included in the programme. We collect the laundry every Thursday/Friday and it is returned to the students every Friday/Saturday. There is free WIFI at the school. We also have WIFI at the residential accommodation in three houses. The other houses do not have WIFI access. The students in these houses can use the WIFI in the common area at the main house or at the school. Most host families have WIFI. There is a safe in the coordinators room in each house for students to put the valuables and money in. Their ID and money will be placed here on day of arrival. They will have weekly access to their money. We recommend that the students place their money here. Please note that in order to encourage English language use and a more interactive language learning experience, phone use is restricted to 5.15 pm – 10 pm during the week for residential students. Students are allowed to use their phones at the weekends. Occasionally during the week, students will use their phones for some class room activities. Students in host families, have access to their phones, but are not permitted to use them when on campus. For any emergencies, please contact 00353 87 051 8592. On Bank holiday Mondays (19 March, 22 April, 6 May, 3 June & 28 October 2019), there will be no English classes, students are offered an excursion/activity in place). We open on the August bank holiday. The residential centre is within three minutes’ walk of the school. Students are housed in four bedroom houses with 8 – 11 students per house and one coordinator. The students will have their breakfast in the house, lunch and dinner is at the language school. We cater for all allergies. Due to an increasing volume of students with peanut allergies, we do not allow peanuts on campus. Host families want you to be a member of their family. They will appreciate your efforts to integrate, your active participation in family life and activities. Your smile, your gratitude and enthusiasm will be the best reward for the host family efforts and encourage the success of your stay. You must always pay your share during an extra-curricular activity with your family. Please use an international calling card when using the host family phone. If not within 5 minutes walking distance, host families will bring you to school each morning and the school bus or host family will take you home every evening. You will have a warm lunch Monday to Friday at the school, a packed lunch on Saturdays and on Sundays you will have lunch with your family. On Monday, Thursdays and Saturdays, you will partake in evening activities on campus, during these evenings you will have dinner on campus and return to your family afterwards. On Friday evening, you can have free time to go into town. If you wish for your son/daughter not to go to the town centre unaccompanied, please contact us. As we are 3 hours and twenty five minutes by bus from Dublin airport, students who are staying in host family and have an early departure (before 2 pm) may be asked to stay on the residential campus the night before. We will notify you on the Friday before departure if you will be moving into residential accommodation. If this is the case, the family will drop you to the residential centre @ 9.15 am on Saturday morning before the excursion with your bags. You will be allocated your room on return from the excursion. It is compulsory to have a European Health Insurance Card/E1 11. This is free for all European countries and will cover any doctor or hospital appointments in the case of any medical issues. It is also compulsory for all clients to have travel insurance. For all non-European citizens, you must take out private medical and travel insurance. We can arrange this for you or you can arrange yourself. Here is important information when travelling to Ireland with children under 18. Please click here. Please ensure that your son/daughter/student is travelling with the necessary documents. We are based 3 hours and 25 minutes by bus from Dublin airport. For this reason, we group transfers together. Typically, we have 2/3 buses at the airport on Sundays, this depends on arrival and departure times and number of students arriving. The shared transfers are based on arrivals between 11 am – 6 pm and departures between 11 am – 6 pm. Students will typically have a 1 – 3 hour wait before the bus leaves the airport. These times may vary if there are flight delays, lost luggage by airlines etc. Please also note that for departures, if you flight is before 1.30-2 pm, you will leave Bundoran around 4.30 am in the morning, this allows for adequate check in time at the airport (you need a minimum of three hours check in time in the summer) and then 3.25 hours to reach Dublin. 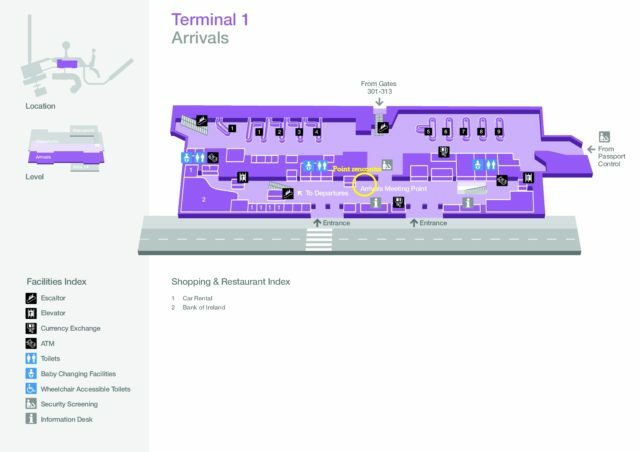 Collection: On entrance of arrivals in Terminal 1 please make your way over to the right. You will see a sign saying Meeting point. Under or around this sign will be a Donegal Language School representative waiting to meet you with a Donegal English Language School Sign(see below). 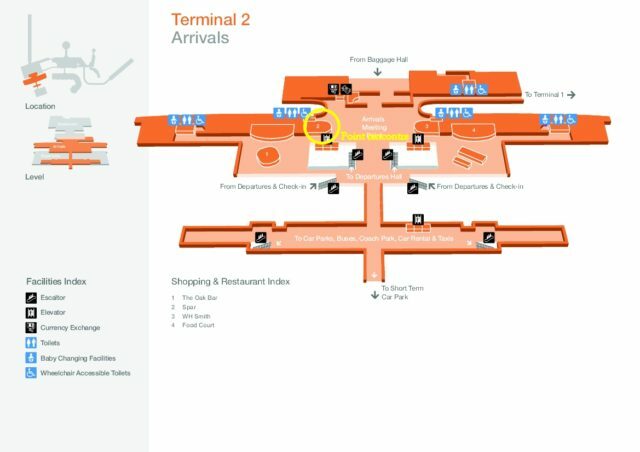 If you are flying into Terminal 2 (Aer Lingus) please make your way to the right towards the Spar shop and one of our representatives will be there to meet you. Baggage: Each airline has individual baggage weight restrictions. Please adhere to and leave room in your bag for presents going home. We have had experiences of students paying up to €100 for excess baggage and don’t wish to see this happening again. Excess baggage is the responsibility of the student. Carry a change of clothes and tooth brush in your carry-on bag. Collection: On entrance of arrivals please make your way to arrivals. A DELS representative will be waiting to meet you with a Donegal English Language School Sign. There is a direct bus from Dublin airport to Ballyshannon every two hours. To arrive at the bus stop, walk out of arrivals from terminal 1 and cross the road, go through the tunnel and you will see a spar shop on your left, walk outside and to the left is the bus stop. Please go to bus stop number 7. To view the bus times please click here. We then offer free transfers from Ballyshannon to Bundoran between 10am and 8.00 pm daily. For transfers outside of these times we can arrange a taxi for you. The taxi fee is around €10. If we are collecting you from the bus in Ballyshannon, please send us an sms to 00353876008205 once you get on the bus in Dublin and then again when the bus reaches Enniskillen. It is really important that you do this as sometimes the bus is late and it ensures that our driver is not waiting a long time to collect you. Please set your son/daughter up with the airline app and they can then check in online prior to arrival and departure. If you need boarding cards to be printed, please email activity@donegallanguageschool.com before 6 pm on Saturday evening. 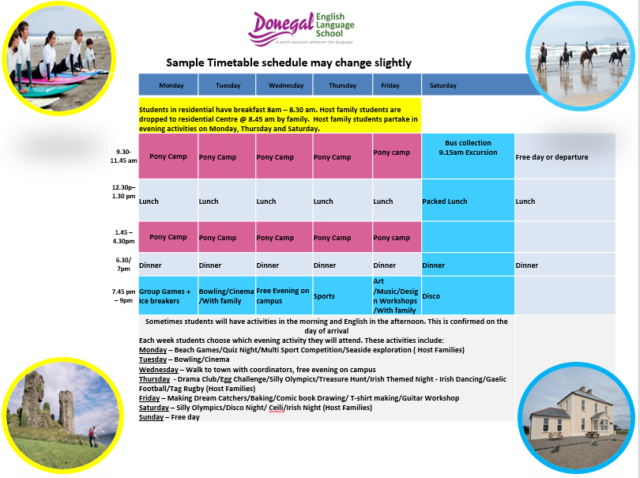 Please note that the office email addresses are not manned after 5 pm on Friday evening and activity@donegallanguageschool.com is not manned after 6 pm on Saturday. Arrival is anytime after 4 pm. Students must not be disrespectful or act in a threatening manner to fellow students or staff of Donegal English Language School or any members of the community. This includes raising their voices, using foul words or foul gestures, broadcasting music with explicit lyrics, being argumentative towards others or being disruptive in class. Discrimination based on sexual preference, race, physical or mental ability, religion, age or ethnicity is not tolerated. Items which promote or encourage discrimination or illegal activity will be confiscated. Smoking and chewing gum is not permitted in the school buildings. Food and drinks are not permitted in classrooms. The student is responsible for any damage he or she may cause to buildings, furniture, fittings, individuals, host family property etc. while registered with DELS. Should a student behave in an unseemly and/or inappropriate manner that may bring the school or its agent into disrepute or cause damage to its reputation or standing in any way, either real or imagined, he or she will be asked to leave. Should a student break other school rules or behave badly he/she may be withdrawn from activities until behaviour improves. If gross misconduct occurs, i.e. bullying or breaking an Irish law (including drinking of alcohol, stealing or drug taking), the student will not be welcome to participate further in the course and will be removed immediately from the programme). Parents must make arrangements for the students to leave the campus/host family promptly/within 2 days. Students will be walked to town and allowed to go to the different shops, amusements or supermarkets for one hour one evening per week. Students must go as part of a group. No student is allowed to go alone without prior permission from the coordinators. If you do not wish for your son/daughter to do this, please let us know in advance of their stay. For residential students only – there will be free time on Sunday. Students are allowed to visit the town unaccompanied between 10 am – 3pm. Students aged 11 will be accompanied, students aged 12 + will be unaccompanied. If you wish for your son/daughter not to go to the town centre unaccompanied, please contact us. Students will visit a place of cultural interest and have some free time shopping. Students over 12 will be unaccompanied during the free time shopping. If you wish for your son/daughter not to be unaccompanied, please contact us. What happens on my first day? Arrivals for students are generally on a Sunday. All students are welcomed to and shown to their accommodation followed by a short introductory meeting. This meeting will go through the first day and any questions that may arise. On the first day of school, students take a test covering reading, writing, listening and speaking to ensure that they are placed in a level most suitable to them. If the students have opted for one of the activity packages, their chosen sport takes place in the afternoon/morning depending on their age and level. Student Coordinators are on hand to help and assist all students through their first day. Please click on the links to log on to facebook or instagram for regular updates on campus life @ DELS. Parents hereby commit to undertaking full financial responsibilities if their son/daughter is dismissed early from the programme in the event of bad behaviour. Above the Bit: Where the horse evades the rider’s aids by raising the head above the level of the rider’s hands. This reduces the amount of control the rider has over the horse. Buck: A leap in the air with the head lowered and the back arched. Canter: Three-beated gait of the horse in which one hind leg strides first (the leading leg), followed by the opposite diagonal pair and finally the opposite foreleg. Called the lope in Western riding. Fox Trot: A short-step gait, as when passing from walk to trot. Gait: The paces at which horses move, usually the walk, trot, canter, and gallop. Gallop: Four-beated gait of the horse, in which each foot touches the ground separately, as opposed to the canter, which is a three-beat gait. Halt: When the horse is at a standstill. In Front of the Bit: A term used to describe a horse which pulls or hangs heavily on the rider’s hand. Leader: Either of the two leading horses in a team of four, or a single horse harnessed in front of one or more horses. The “near” leader is the left hand horse and the “off” leader is the right hand horse. Manege: An enclosure used for training and schooling horses. Also called a school. Nearside: The left hand side of the horse. Offside: The right hand side of the horse. On the Bit: A horse is said to be “on the bit” when he carries his head in a near vertical position and he is calmly accepting the rider’s contact on the reins. Overreaching: Faulty gait in which the hind footsteps on the heel of the front foot on the same side. Occurs most often when the horse is galloping or jumping.